Emotion is energy. It is raw, live and powerful. Energy must flow, if not, it will become stagnant, and create energy blocks in our body, mind and soul, resulting in dis-ease, disharmony and all sorts of issues, problems, and crisis in our life. Therefore, it is very important and necessary to allow emotions to flow constructively with the understanding that emotion is nothing more than energy. The purpose of healing is to release the energy blockage, thereby allowing the energy to flow easily and smoothly. This will create balance, peace and harmony in our own body, mind and soul and we will be positively contributing to the whole of humanity and the human world. As such, crying and constructively releasing anger, facing fear and insecurity are all meant to free the repressed and trapped energy that is inhibiting our soul growth. It is the most inexpensive, yet the most powerful and efficient healing remedy on many levels. We just need to learn not to throw our emotion to anyone uncontrollably, or to hurt others irresponsibly while we are releasing our emotions. This affirmation is designed to assist you to understand your emotion and its powerful influence in your life, and to encourage you to release whatever emotion you have; freely and constructively without feeling inadequate or any embarrassment. By saying this affirmation, you are consciously working on creating the positive reality you desire. The more you say the affirmation, the more positive and flowing your emotion will be, and the more positive change you will create in yourself and your life. It will not happen overnight, but slowly and surely you can move out of the negativity, and create an abundant, happy and wonderful future for yourself. 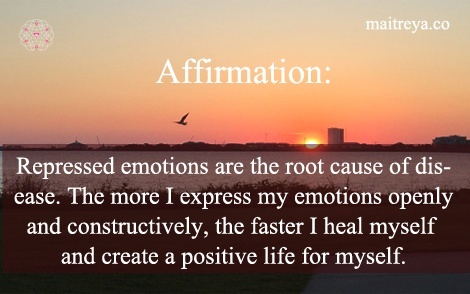 You can repeat the affirmation as many times as you wish. The more you say it, the more positive reality you can manifest in your life.